The debate over which way to vote in the Scottish Referendum is hotting up. The polls say that the gap between those voting to stay in the United Kingdom is now only a few points ahead of those planning to vote for independence. With many still undecided, there has been a tidal wave of people registering to vote, particularly among the young. The norm for UK electoral turnout is poor. Fewer and fewer people bother to vote in local and general elections. Governments can come into power on less than a quarter of the electorate voting for them. But in a few days Scotland may going to show us how it should be done – some predict a turnout of 80%. The intellectual chasm between the Yes and the No camps is getting wider by the day. Forget the dull and dismissive campaigning from Better Together. What they have to say is truly uninspiring and so led by Westminster that even the Scots among them barely raise their voices with passion about their land. They stick with the doom-and-gloom arguments about an independent Scotland falling into in dire economic straights without the support of the rest of the UK – but hasn’t the status-quo left us all in dire straights? So it must have dismayed the No campaign when news came out that there’s a fortune in oil and gas waiting to be exploited off the West Coast of Scotland. An investigation undertaken by oilandgaspeople.com, the world’s largest oil and gas industry jobs board, and independent North Sea oil and gas industry experts found that the West Coast alone could provide oil and gas for at least 100 years with an estimated value of more than £1 trillion. Wiped out are Better Together’s sneers that Alex Salmond is relying entirely too much on oil revenues to finance his promises. They also cannot seem to look beyond Salmond and the Scottish National Party, who were at least responsible for making the referendum a reality. But there is a host of pro-independence groups besides the SNP, and I fear it is far too late for the Better Together team to engage with them. The Labour Party sent their leader Ed Miliband to Scotland (the Labour Party founder Keir Hardy’s birthplace, no less) to rally the Scottish Labour supporters and persuade them all to vote No. But many have already switched to the Yes side. Sticking with the UK and Westminster to them means social injustice and poverty. Independence offers them some hope. “We’re all ex-Labour supporters – but now they’re just Tories in red ties,” said one. The No side is also using the wrong language. After one or two incidents of harsh words and egg-throwing, a senior figure in Better Together was quoted as saying that on polling day it would be “absolute carnage.” That’s hardly a balanced or adult thing to say. One would think he was hoping it would be so. And the Scottish Police Federation chairman warned campaigners and politicians against using “intemperate, inflammatory and exaggerated language”. Quite. There’s a real chance that there could be trouble five days before the referendum, when the Protestant Orange Order plans to march through Edinburgh. These are the Unionists big-time, with their roots in Northern Ireland and a long history of maintaining sectarian division. They do not want to leave the UK. Yes activists have been advised not to rise to the provocation and to stay away – any clashes could only harm the independence cause. And, although no one has mentioned it, the Orange Order’s parade could be joined by the National Front, one of the nastier of the British political parties. On the other hand, Scotland has a chance to have a laugh the day before the Orangemen swing in to action with their fifes and drums. The leader of the United Kingdom Independence Party (UKIP), Nigel Farage, is to visit Glasgow. Rightwing UKIP wants independence from Europe; that is its main, if not its only policy. In England it is becoming a serious worry for David Cameron and the Tories. Many Tory euro-sceptics are looking towards UKIP to help them get the UK out of the European Union. Leftwing Glasgow won’t be kind to Mr Farage. His two previous visits to Scotland were not well received. He was forced to hide in a pub last year (not a hardship for Nigel, who is fond of propping up bars when campaigning), and he faced a massive leftwing demonstration last May. But here’s the rub for Nigel and his No campaigners. The majority of Scotland’s business community and much of the general population want to stay in Europe. As an independent member of the EU they could well negotiate terms more favourable than those they live under at present – which of course tend to favour England and large landowners. 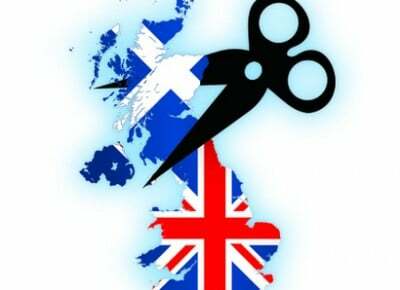 Scotland fears that, if they stay with the UK they will find themselves taken out of the EU regardless. For some the biggest threat to the Scottish economy is not independence, but a potential British exit from the European Union. Stay with one Union and lose the other is the choice they face. Even if Scotland’s independence isn’t that much of a success and people end up poorer than they thought they would be, they would have this to comfort them: that they will be in charge of their own poverty; it will not be thrust upon them by Westminster. A remarkable difference that Better Together, London and Westminster-oriented, has failed to recognise .